1. 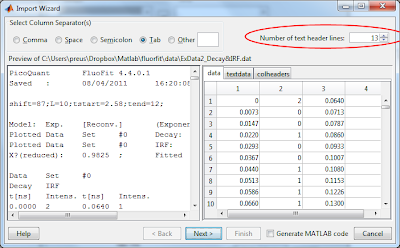 Through the File menu -> Load decay and Load IRF. 2. The shortcuts Ctrl+L (decays) and Ctrl+I (IRFs). 3. By pressing the '...' buttons below the data listboxes. 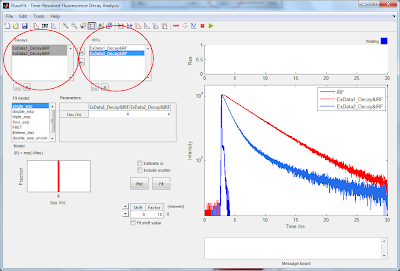 In this example decays and IRF data is loaded simultaneously using Ctrl+L. 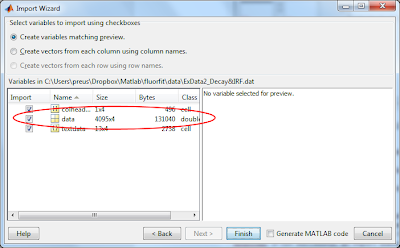 In the final import dialog window a variable named 'data' must be defined in order for DecayFit to read the opened data file. Press Finish. 4. 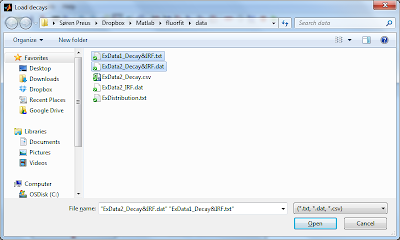 The loaded data sets is displayed in the Decays and IRFs data listboxes. 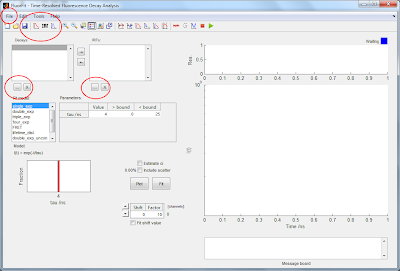 Note how all selected decays and IRFs in the listboxes are automatically plotted in the graph window.